Okay so maybe they aren't exactly world famous, but my pumpkin chocolate chip cookies are pretty popular among the few crowds we run in. Even my mom, who swears she doesn't like pumpkin, requests these cookies every single year. They are my favorite cookies to make and also to eat, which makes things convenient. They are soft and moist and really, just so freaking good. Anyway. Enough chit chat. The recipe is below! Heat the oven to 350 Degrees F. Line cookie sheets with parchment paper. Using a mixer, beat butter until smooth. Add in white and brown sugars, and mix until mixture is light and fluffy. Beat in eggs 1 at a time, then mix in vanilla and pumpkin puree. In a large bowl, whisk together flour, baking soda, salt, cinnamon, ginger, nutmeg, and cloves. Slowly beat dry mixture into the batter. Stir in the chocolate chips. 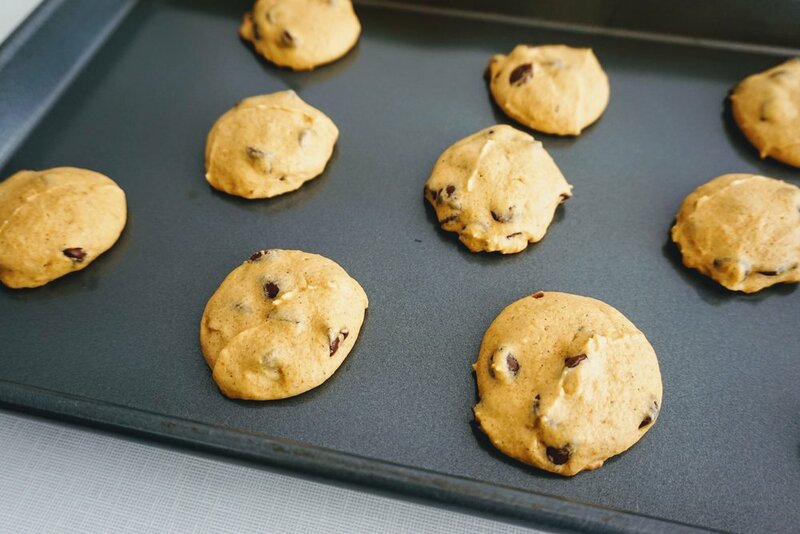 Scoop dough onto cookie sheets and bake for 12-13 minutes. Let cookies rest for a few minutes before moving them to wire racks.